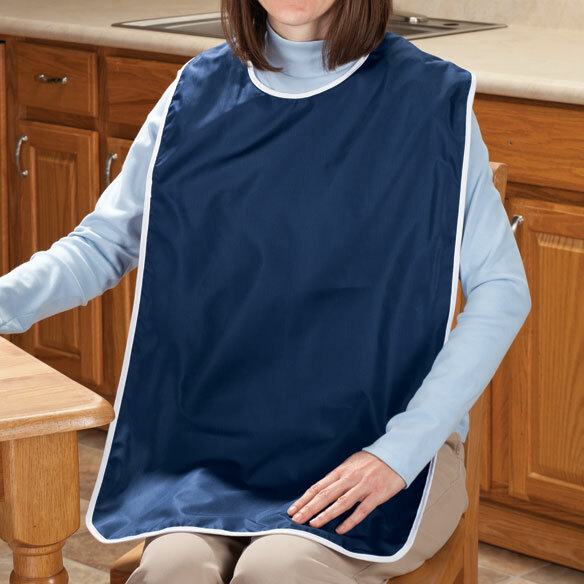 Make mealtime more pleasant and cleanup easier with this waterproof shirt protector. Lightweight design with easy on/off hook-and-loop closure is ideal for those with limited strength and dexterity. Polycotton top, supplex lining. Machine wash warm, tumble dry. Regular: approx. 27 1/2" L x 17 1/4" W. XL: approx. 27 1/8" L x 23 3/8" W.
Good protection for spills on good clothing. Pay the extra and buy. Don't try the others and spend $16 and then end up buying this. Wipes clean between washes; appears to be stained but washes clean. The only negative is the size of one of the fasteners. Added more Velcro to allow for more flexibility in closure. VERY NICE WAS THINKING OF BUYING ANOTHER. I always get food on me, especially in public. If you're not embarrassed to wear something like this (I wear napkins all the time when I go out), then you will love it. I went out last week without it and got food on my pants. This covers not only the chest area, but your lap, too. 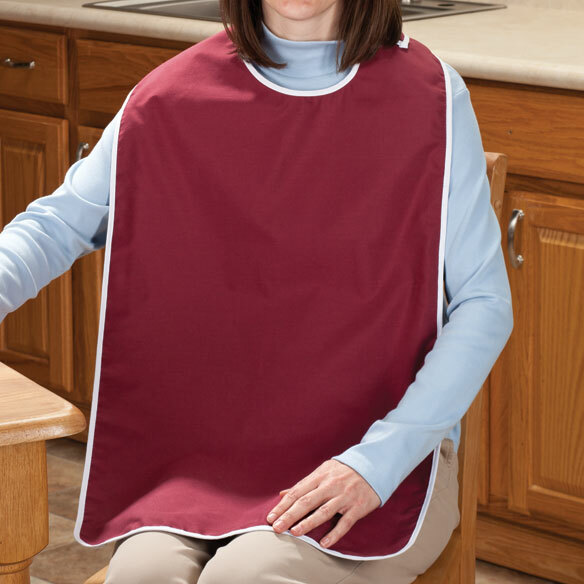 When I watch TV when eating, I use my adult bib. I am short (under 5') so the bib is a bit long. The front ia nylon and the back is able to keep stains off my clothes. I really love it. Use to catch crumbs while eating casually away from the table. Purchased to protect Mom's clothing from spills while eating. Allows her to continue to participate in feeding herself without staining clothing. Bought 2 of the butterfly patterned, pretty and not so institutional in appearance. To help avoid cleaning/washing of clothing! To help keep my clothes nice and clean. This can help keep Parkinson's patient clean when eating. My hands sometimes tremble and food drops. Constantly splashing foods on my dress shirts, some food stains just don't come out, maybe this will help save some shirts. 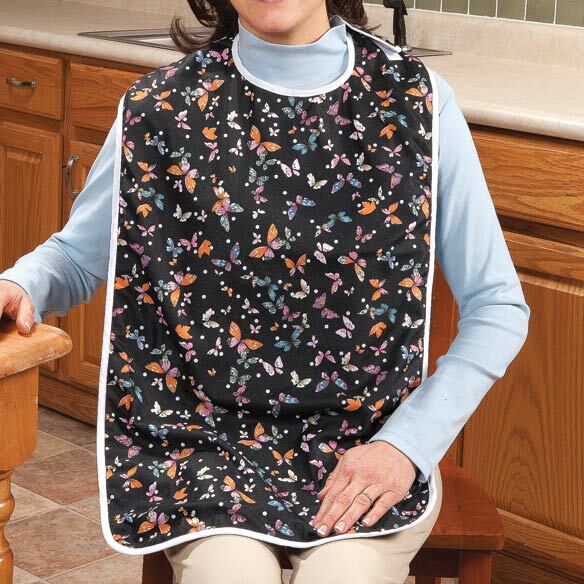 Mom needs a bib, liked the butterfly one. Protect my husband shirts at dinner time. Eat drumstick ice cream and invariably end up with chocolate on my blouse. Also for my 96 yr. old Mom. Already Purchased one but needed another. Have one, ordering a second. Mom has been having some trouble keeping her tops clean when eating. These looked to be the best in coverage and ease of cleanup. I need something to cover my clothes where I don't get stains and this will be easier and cover better than a napkin. I am always getting food on my clothes when I eat. Need these for protection of clothing. Everything I order from your company I "Exceptional". I will continue to purchase things that your company offers. Shaky hands with nerve damage makes me a spiller. The design of extra length seems perfect. I wanted something to protect my clothes when I cook and these shirt protectors look like they will work well. When he,s eating and drinking. My husband stains every shirt he wears and this will be a great saver in my laundry! Looks like just what I need for my husband who currently uses his stomach as his table. I bought these for a couple members of our Post to use when eating. Have to protect their uniforms. I seem to always spill something down my front every time I eat so this will help with keeping my clothes clean. Save clothes from food stains when I cook and eat. My Mother has had a stroke. It has damaged some muscles on the left side of her mouth and she has difficulties with spillage of food and also when she drinks. I need to know if this product is really waterproof? BEST ANSWER: Thank you for your question. Yes, this item is waterproof. We hope this information will be of help to you. We like it very much. It is totally waterproof and wipes clean. Does well in the washing machine.